The title says it all. 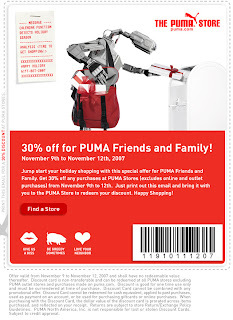 See below for a 30% off coupon for the Puma Friends & Family Event going on from Nov 9th to Nov 12. You can be sure that I'll be scoping out the shoes after work today. I love Puma shoes, I just never buy them because they're kind of expensive. But the pair I'm wearing now is getting pretty worn out, might be time for some new ones. There's a Puma store right on Newbury (333 Newbury St). And apparently one at the Natick Mall also. Oh and for all you non-Boston readers. There's a store locater button on the upper left hand corner of the Puma site (here). So to download the coupon, click on it so the larger version pops up, then right click and do a "Save As." If anyone has any problems getting that to work, send me an email and I'll email the file to you. 6 Response to "30% Off Coupon At Puma"
I like your blog -- especially the stuff about fitness. Do you know anything about the current SCLA promotion they're running where they're giving away a complimentary week at the gym before 11/26? A complimentary week isn't really a promotion. If you go speak to someone at the membership office at anytime, they will give you a free week to checkout the gym. If you are interested in joining, email me and I will talk to someone there to see if i can get you a referral discount on the initiation fee. Is the SCLA really worth it? I go to Healthworks now and I love it -- they have Forza and boxing and they might start having a capoeira class. SCLA doesn't seem to offer any fun classes like that; it's all yoga and spinning. What's your take on their class situation? I think it's worth it, it's really a great facility. I've never been inside a Healthworks so I can't compare. SCLA has a basketball court, squash courts, a boxing area, and a swimming pool - which is quite tough to find in downtown boston. I don't really take the classes, I normally just run and lift free weights. How deep is the pool? I know they say it's jr olympic sized, but it doesn't mention the depth. It's been about a year since I've used the pool there, but I'd say that it's somewhere between 4-5 ft deep. They have some water aerobics type classes in the pool sometime so it's shallow enough to stand in. I'll try to get you an exact measurement the next time I go to the gym.